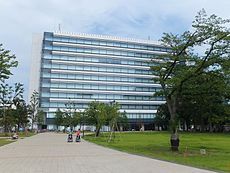 Wholly-owned subsidiary of Nisshinbo Holdings Inc.
Japan Radio Co., Ltd. (日本無線株式会社, Nihon Musen Kabushiki-gaisha) is a Japanese company specialising in the field of wireless electronics for the communications industry. Established in 1915, the company has produced a wide variety of products including marine electronics, measuring equipment for telecommunication, radio broadcasting equipment, and amateur radio equipment, including the JST-145dx/JST-245dx HF transceivers, which were the last amateur radio transceivers produced by JRC, ending in 2002. Even though these transceivers have been out of production over 10 years[update], they still compete in performance with current[when?] high-end amateur transceivers available from other amateur radio manufacturers today,[when?] and have become prized possessions of the hams that are fortunate enough to own one. JRC still supports these radios through 2015, per information on their Web site. ^ "Company Data". Japan Radio Company. Retrieved April 21, 2017. ^ "Company Profile". Nikkei Asian Review. Nikkei Inc. Retrieved April 21, 2017. ^ "Notice regarding execution of share exchange agreement concerning Nisshinbo Holdings Inc. making New Japan Radio Co., Ltd. a wholly-owned subsidiary" (PDF). Nisshinbo Holdings Inc. website. Retrieved May 10, 2018. This page was last edited on 18 December 2018, at 05:38 (UTC).